The aim of this assignment is to design a comprehensive nursing care plan for a given case study of Barbara Green. This plan would be designed using the well known and widely accepted Levett Jones clinical reasoning framework along with Miller’s functional consequences theory of healthy ageing. In this assignment, first the case study would be analyzed to identify three nursing care priorities for Mrs. Green and then the most important issue needing immediate intervention would be selected and a nursing intervention plan for that particular issue would be discussed in detail. In the final section, the registered nurse would evaluate the outcome for the patient, check for her improvement and would reflect upon his own experience including learning as well as own limitations. As per given information, a registered nurse has been assigned to manage, Mrs. Barbara Green, 89yrs old woman living alone in her house and having deteriorating health conditions since last two years. As per the requirements, two theoretical frameworks would be used to design an effective patient centered nursing care plan for the client to address her individual needs and requirements (Forsman, et al. 2011).. The first model is Miller’s functional consequence theory of healthy ageing that has been suggested for nurses to identify the support and care required by old aged patients by identifying their non modifiable age related health changes, modifiable risk factors and the impact of these factors on their overall health and functionality (Daley & Spinks, 2000). 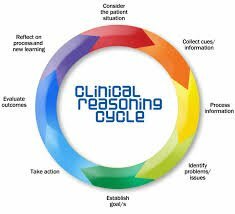 Another essential concept is clinical reasoning cycle having eight important steps used to analyze current condition of the client by assessing giving information and doing required medical examination, identify nursing care issue, accordingly plan nursing interventions, evaluate the outcomes and also learn from the process by doing a self reflection. This process is in a cycle form and thus, the steps repeat itself on completion and the stages are shown below in fig. 1. These eight stages of clinical reasoning cycle would be used to solve the given case. Consider the patient situation: first and foremost the patient would be considered. Mrs. Barbara Green had spent an active social life with her husband but since last two years after her husband’s death, she is staying alone in her house. She is currently having deficit vision, stiffed, painful and swollen joints and limited joint movements. Her hip, knee, fingers and back joints are more painful and have affected her walking and mobility. Due to these problems, she has stopped driving and going out and stays most of the time at home. She even finds it hard to perform ADLs, has limited food items at home and does not eat properly. However, any significant weight loss has not been reported. She is already taking paracetamol, ibuprofen, thyroxine and hydroxychloroquine as per prescribed doses. On applying Miller’s Functional consequences theory, age related and risk factors are to be identified for the client so as to promote wellness by modifying negative functional consequences of risk factors and taking health promoting interventions. Several age related changes has taken place in the client. Her eye sight has become weak due to weakness of eye muscle and deposits on retina. Her joints has become stiff and painful due to loss of bone mass, wearing away of cartilages between joints and decrease of intra articular fluid. Over that, her dry macular degeneration, osteoarthritis, rheumatoid arthritis and hypothyroidism is acting as risk factors and worsening her condition. Her ability to walk, move, see, drive and to do daily chores like managing her house, cooking, going out, etc has diminished and she has become isolated (Madry, et al. 2011). In this stage, the already given important information is collected and new information is gained through health assessment. Barbara’s current condition of limited mobility, painful joints and deficit vision is not allowing her to perform her day to day activities and impacting her quality of life. She was an active member in her community along with her husband and now these diseases and symptoms have not only affected her ability to perform ADLS but have also hampered her social life. She is staying alone at home, not eating well, has very limited food items at home and even the house is unkempt, showing her limited abilities, disinterest and loneliness (Rodda, et al. 2011). Following the collection of cues, they would be analyzed to make inferences and generate hypothesis. On considering patient’s condition and given information, it seems that osteoarthritis, rheumatoid arthritis along with increasing age of patient has lead to joint stiffness, pain and swelling in joints and limited movements (Levett-Jones, 2013). Further, dry macular degeneration that mainly affects central vision of the affected person due to deposits on macula has affected her vision majorly. Additionally, her age also must have contributed to the issue. Due to these diminished vision and limited mobility, Barbara has become isolated. She hardly drives or goes out and stays alone at her house and is not even managing her house. It is also evident that she is not eating well. All these may suggest her isolation, loneliness and depression. Of these three nursing care priorities, the top nursing care issue is her limited mobility and walking abilities. Her painful and swollen finger hip and knee joints do not allow her to move or walk properly making her dependent over others even for small day to day activities. She totally lost contact with her friends, is not able to move out of her house, is getting isolated and lonelier due to this condition (Zimmermann, et al. 2011). Next step is to undertake interventions so as to accomplish these set nursing care goals for the client and enhance her quality of life by extending support to her. The registered nurse would first of all try to communicate with Barbara to assure her that she is available to support her in all ways possible (Choy, 2012). The nurse would explain her condition and would discuss the plan and intervention to involve her in decision making process. Following this, by taking Barbara’s consent and involvement, the nurse would take nursing actions as planned. She would refer Barbara to her GP to assess her symptoms and reconsider medicines and doses. After that, the nurse would strictly follow the prescribed medicinal regimen and would encourage the client to do the same. It is really important to relieve the arthritis symptoms of pain, swelling and discomfort to a bearable level and for that along with medicines; some complementary and alternative therapies would also be required. As per research studies, therapies like physiotherapy, regular exercise, applying hot packs on affected joints and acupressure have been found to be really effective. Thus, after consulting physiotherapist, Barbara would be encouraged to do recommend joint movement exercises (Hunter, 2016). The nurse would also take guidance from a dietician and would ensure that the client eats a balanced and healthy diet. A healthy diet is very necessary to be physically and mentally fit especially in this case when the client is not eating properly. Along with this, hot packs would be applied to her joints regularly and proper rest would be encouraged. Certain mechanical aids may also be recommended like walking sticks to help her walk. Basically, the nurse needs to be available for Mrs. Barbara at all the time, ensure her health and safety, provide her required care, address her needs and support her overall wellness. She needs to encourage the client to follow a healthy regime to keep the symptoms and disease under control and have a better quality of life (Singh, 2015). In this stage, client’s cues and current condition is evaluated to see whether an improvement has occurred and the set goals are achieved. For that, Barbara’s previous state would be compared with the present one. Initially the reported pain will be identified. Whether it is controlled or not keeping intolerance aspect of pain as well. A pharmacologic regime will be prescribed for ADLs in order to perform daily chores. This was a crucial learning experience for me as it helped in a great way to learn and experience about osteoarthritis and rheumatoid arthritis. Also, I came across various therapies and treatment setups which can be utilized to counter the symptoms of arthritis. I regret a few things regarding my communication skills, as I was unable to understand the accent of patient. I am determined to improve my communication skills for further communication with clients. As per the given case study, health conditions of Barbara is deteriorating since last two years and a registered nurse has been assigned to take care of her who has used clinical reasoning cycle and Miller functional consequences theory to identify client’s top nursing care issues and interventions. On analysis and examination, client’s inability to walk and move, deficit eyesight and isolation is found as nursing care priorities and her limited mobility is marked as the key priority issue to be addressed immediately. For that the nurse has set goals and would help, support and take care of her by using both pharmacological and non pharmacological treatment modalities to achieve those goals. Finally, the outcomes have been evaluated by comparing before and after situations. In the last section, the nurse has reflected her learning exercise and identified her shortcoming of weak communication abilities. 1.Daley, M. J., & Spinks, W. L. (2000). Exercise, mobility and aging. Sports Medicine, 29(1), 1-12. 3.Ito, M., Nakata, T., Nishida, A., & Uetani, M. (2011). Age-related changes in bone density, geometry and biomechanical properties of the proximal femur: CT-based 3D hip structure analysis in normal postmenopausal women. Bone, 48(3), 627-630. 5.Hunter, S. (Ed). (2016). Miller’s nursing for wellness in older adults (2 nd Australia and New Zealand ed.) North Ryde, NSW: Lippincott, Williams and Wilkins. 6.Madry, H., Grün, U. W., & Knutsen, G. (2011). Cartilage repair and joint preservation medical and surgical treatment options. 7.Mather, C. A., McKay, A., & Allen, P. (2015). Clinical supervisors' perspectives on delivering work integrated learning: A survey study. Nurse education today, 35(4), 625-631. 9.Rodda, J., Walker, Z., & Carter, J. (2011). Depression in older adults. BMJ-British Medical Journal, 343(8), d5219. 10.Salminen, H., Zary, N., Björklund, K., Toth-Pal, E., & Leanderson, C. (2014). Virtual patients in primary care: developing a reusable model that fosters reflective practice and clinical reasoning. Journal of medical Internet research, 16(1), e3. 11.Schlesinger, N., Alten, R. E., Bardin, T., Schumacher, H. R., Bloch, M., Gimona, A., ... & So, A. K. (2012). Canakinumab for acute gouty arthritis in patients with limited treatment options: results from two randomised, multicentre, active-controlled, double-blind trials and their initial extensions. Annals of the rheumatic diseases, annrheumdis-2011. 12.Singh, J. A., Cameron, C., Noorbaloochi, S., Cullis, T., Tucker, M., Christensen, R., ... & Wells, G. A. (2015). Risk of serious infection in biological treatment of patients with rheumatoid arthritis: a systematic review and meta-analysis. The Lancet, 386(9990), 258-265. 13.Zimmermann, E. A., Schaible, E., Bale, H., Barth, H. D., Tang, S. Y., Reichert, P., ... & Ritchie, R. O. (2011). Age-related changes in the plasticity and toughness of human cortical bone at multiple length scales. Proceedings of the National Academy of Sciences, 108(35), 14416-14421.